Hurricanes, hail, tornadoes, flooding — these and other extreme weather conditions can threaten your safety and damage your car. Learn how to prepare for hazardous weather and help minimize the damage to your vehicle. Earthquakes can hit your area without warning, even if you are not on a recognized fault line. Here’s what to do if an earthquake hits while you’re driving your car. If you’re in a tornado’s path, you won’t have much time to find shelter from it. When you prepare for tornado season ahead of time, you can increase your chances of protecting yourself and your property in the face of a tornado or heavy windstorm. Pack a first aid kit, a battery-powered radio, flashlight, extra batteries, canned and other non-perishable food, a hand-operated can opener, bottled water, sturdy shoes and work gloves, extra car keys and written instructions on how to turn off your home’s utilities. Heavy rains often accompany tornadoes. Do not travel down a road submerged in water — underlying currents could carry your car away. If your vehicle stalls in water, immediately abandon it — floodwaters can rise several feet in a matter of minutes. Another likely threat: collapsed or collapsing roadway. Winter brings treacherous driving conditions, and ice storms can present more severe driving conditions than even major snowstorms. Snow actually can enhance traction on icy roads, while ice storms deposit layers of treacherous, often-invisible, ice on virtually every surface. 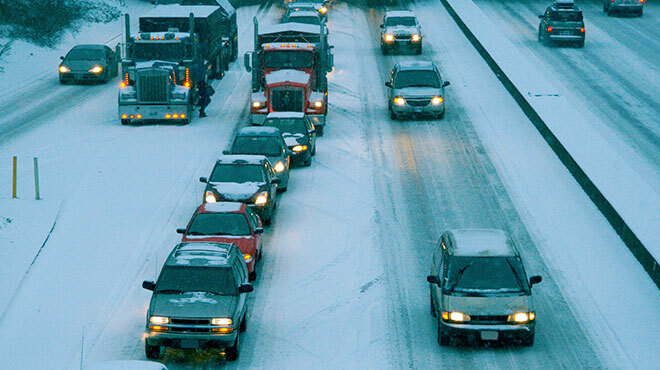 Let the road crews — and Mother Nature — improve bad conditions before you leave. Just a few hours can make a huge difference in driving safety. Make sure you always have enough traction — don’t try to make those tires last just one more winter if the treads are worn. If your car’s heating system isn’t operating properly, fix it now. This will keep the fuel line from freezing and ensure you have enough gas in case you are stranded in traffic. Always carry a functional scraper and a small shovel in your car during winter. Year-round safety items should include a cell phone, flashlight and extra batteries, blanket, emergency sign and a high-protein snack bar. If you’re heading out for a trip on icy roads, let someone know your destination, the route you’re taking and how long you will be gone. If the local safety authorities recommend you stay off the road, take their advice.